Dunder Mifflin T-shirt. Classic t-shirt for fans of the smash comedy The Office. 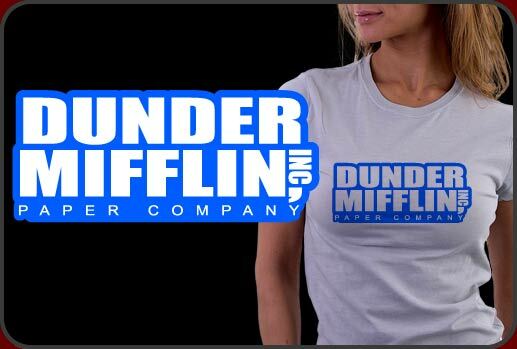 The NBC series The Office starring Steve Carell, Jenna Fischer and Rainn Wilson has been such a blockbuster hit we had to create a fun and attractive Dunder Mifflin T-shirt for our inventory and this one looks really terrific. The Dunder Mifflin T-shirt looks great on any color shirt material and color and is a must have for fans of The Office.